More than 200 people are still unaccounted for, as wildfires continue to sweep across large areas of California. The death toll has risen to 31, while 250,000 people have had to flee their homes. And the news keeps getting worse. Strengthening winds are threatening to increase the spread of flames. California Governor Jerry Brown has asked US President Donald Trump to declare a major disaster, which would bring in more federal emergency funds. Mr Trump angered many when he threatened to cut funding to California, blaming the fires on poor forest management. 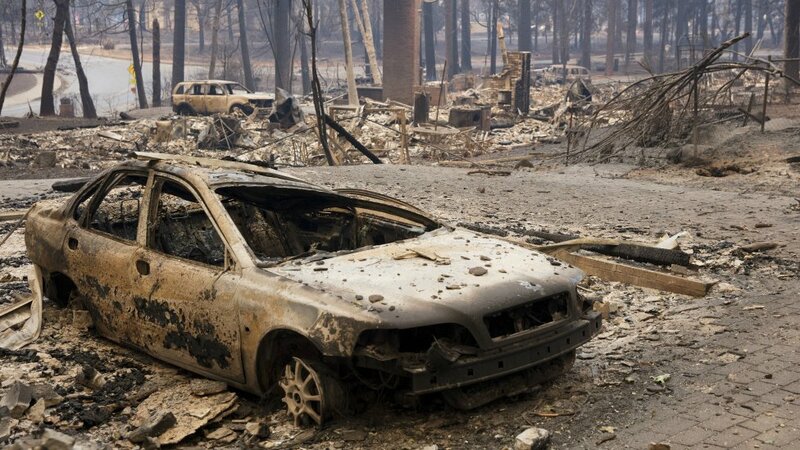 Here are pictures showing the destruction in California. Meanwhile, we look at the techniques used to fight wildfires. Theresa May’s struggling to get her ministers to agree an approach to Brexit, but the BBC has learned that several cabinet members expressed doubts from the start. Boris Johnson and David Davis quit the government in July over the prime minister’s so-called “Chequers plan”, which the cabinet backed. However, BBC political editor Laura Kuenssberg says concerns were raised by other ministers at that stage, including some former Remain supporters. Here’s all you need to know about Brexit. Scientists say they’ve found a potential way to spot dementia before any symptoms of mental decline appear, using a five-minute scan. International researchers led by University College London used ultrasound scanners on the necks of more than 3,000 people, finding that those with the most intense pulses went on to experience the greatest signs of cognitive decline. A more intense pulse can damage the brain’s small vessels, causing mini-strokes. Fake news is a much-discussed subject, but what encourages its spread? The BBC’s carried out research in India, which suggests a rise in nationalism is causing people to disseminate it using their mobile phones. Also as part of our Beyond Fake News series, we look at what constitutes fake news and how you can spot it. Pictures of events held to mark 100 years since the Armistice ending World War One dominate the front pages. “Never forget” is the Daily Mail’s headline, as it calls for better treatment for today’s service personnel. The Daily Mirror shows a uniformed veteran pointing out the names of the dead on the Armed Forces Memorial in Alrewas, Staffordshire, to a young girl, its headline reading: “For your tomorrow they gave their today.” Elsewhere, the Daily Telegraph leads on former Foreign Secretary Boris Johnson calling for a cabinet “mutiny” over the prime minister’s Brexit plans. And the Sun reports that a mother and daughter waiting for a council home had to live in a hospital for 15 months. Today Anti-Bullying Week starts in the UK. 08:00 The second day of the Paris Peace Forum, a discussion of global governance, begins. 1954 Ellis Island, New York’s main immigration control centre, shuts down after 62 years, having admitted 15 million people to the United States.